MELBOURNE:- Homes available for sale across Australia are up 68 per cent on last year while sales volumes have slipped dramatically. The real estate industry has immediately flipped its argument and is calling a ‘buyers market’. “Not so fast!” Prosper Australia campaign manager David Collyer said today. “The supply of houses for sale has ballooned, but demand has vanished, just vanished. Yet vendors are in denial that the capital gains game is over. “This so-called ‘buyers market’ – one where buyers are spoilt for choice – remains stuck at previous high prices. Buyers are refusing to pay high prices when the supply and demand equation has changed with such force. “Australia’s housing bubble has burst,” Collyer said. “Consumers have giant mortgages and maxed-out credit cards with very little to show for it. Yesterday’s national accounts revealed households saving a whopping 11.5 per cent of incomes as they slough off these debts. Further, Government economic settings are far from accommodating. Treasury told Senate estimates this morning of the “extremely rapid fiscal consolidation,” by federal and state governments combined, tightening fiscal policy by a total of 4.25 per cent of GDP over the next two years. On Tuesday, SQM Research released their price forecast for calendar 2011. They predict further substantial falls in prices in the remaining seven months of this year in every city and region across Australia. “SQM’s forecast is the most honest assessment of current trends I have seen,” Collyer said. In inner Melbourne, currently down 6% from its peak, SQM expect a further decline of 7-9% in 2011. With inflation running at or above 3 per cent, any clear-eyed person will also subtract that to see the real price change. Docklands is particularly ugly, as Earthsharing’s Speculative Vacancies Report last week showed. According to their water meters, 23.3% of these to-die-for apartments are vacant. 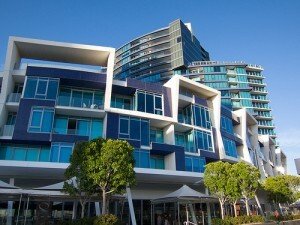 A chic median-price Docklands apartment selling in January for $600,000 will lose $90,000 by year’s end. Less another $18,000 for inflation and owners are down $108,000. “No wonder developers are putting away their cranes. The owners – many just put down a tiny pre-construction deposit – have every incentive to sell. And alert buyers are staying away in droves. •	Prosper’s Home Buyers Strike campaign was launched on March 15 to inform home buyers price falls in the housing market were imminent. •	Prosper called the bursting of The Great Australian Land Bubble on April 12.